Now in its fortieth year of continuous kit car production, Marlin not only retains the retro styling of the original Roadster within the current Sportster, but also o­ffers a modern mid-engined alternative via the EXi. Time for an update. Words and pictures: Ian Stent. AGEING GRACEFULLY MARLIN EXi REVISITED: BACK BY DEMAND Driven: mid-engined Marlin that’s on the market again. As Marlin celebrates 40 years in 2019, we take a look at the refreshed and renamed EXi. Forty years of continuous production… that’s a milestone worth celebrating and Complete Kit Car will be returning to the heritage of Marlin in a forthcoming issue. From Paul Moorehouse’s original Roadster of 1979 to today’s Sportster created under subsequent owners Mark and Terry Matthews, the lineage is clear to see and it’s worth remembering that today’s company has actually been manufacturing Marlins for far longer than the original company (14 years versus 26 years), having bought the rights in 1993. By any measure that’s an impressive feat. For the last few years, efforts have been focused on the model that most obviously continues the Marlin lineage, the Sportster, but 2019 will witness revised focus on the company’s other model, the mid-engined EXi. Originally Rover based and marketed as the 5EXi at its launch in 2003, the model witnessed significant sales success through much of the following decade. A factory-backed race program saw the car continually developed, to the point when it was last actively marketed it was VAG based and most usually powered by the 1.8-litre turbo engine found in a variety of Audis, VWs and Seats. Having lain largely dormant more recently, renewed customer interest has caused the company to revisit the model and give it a fresh push in 2019. While there wasn’t a factory demonstrator when we visited, an early Rover based car was in for servicing work and provided a useful reminder of what this strikingly designed roadster is all about. This car’s blue and black livery suits the EXi well, particularly when sitting on 17in Lotus Elise alloy wheels and augmented with a Lotus sourced rear wing and, perhaps most strikingly, a roof panel which looks to take its inspiration from an Exige. The Hethel links continue in the cockpit, with Elise seats, and it’s under the rear deck where the most significant Lotus addition can be found, in the form of a 1.8-litre VVC Roverderived Elise engine and transmission. Back outside, the EXi styling is still remarkably fresh, even if the DNA of the lines can trace all the way back to the Strathcarron of 1998. It’s found here with Marlin’s optional wide rear track suspension, which enforces wider rear arches. Combined with the rear wing and roof panel, this EXi has a more aggressive stance than most. Although the EXi was latterly developed with optional doors, this car does without and the factory is currently hesitant as to whether doors will remain an option. While that’s not a problem with an open EXi where it’s easy to hop over the sides, with the fixed roof panel of this customer car, it’s more challenging! The roof is not a panel originally supplied by the factory, but instead something developed by the customer. However, Marlin is now looking to develop something similar as a regular factory option, and retaining ease of access will inform exactly how the production panel is developed. 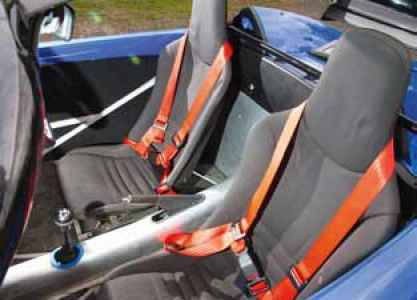 Once inside, the Elise seats offer a welcome level of padding compared to bare fibreglass seat shells, but Marlin has always produced its own specially designed seats for the EXi which can either be had bare or fully trimmed. The steering column retains the donor car’s adjustability (although appeared fixed on this example) so combined with seats on runners, it should be easy to find a good driving position. 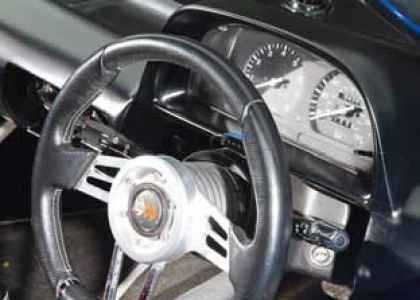 Fabricated pedals are well spaced and the original donor instruments (Rover in this instance) are easy to read through the relatively generous size steering wheel. While there’s the Rover K-series engine in this car, Marlin is no longer offering it as an option, instead focusing owners on the VAG 1.8-litre in either naturally aspirated or turbo form. In some respects it’s a shame the K-series is no longer available. Despite its reputation for head gasket issues, it’s a relatively compact and light unit and, in 1.8-litre VVC form, gives this EXi thoroughly entertaining performance, with bags of revs and a decent slug of power. 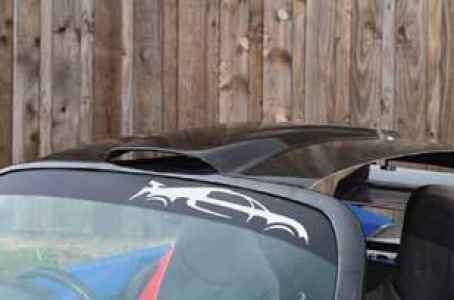 For all this, the VAG engine will hardly be lacking in power or grunt, outgunning the K-series easily when it comes to the head count of horses – whether naturally aspirated or turbocharged. While this car features Rover based components elsewhere, all things are relative. In reality, the EXi features fabricated double wishbones at each corner, so it’s only the front uprights and rear hubs etc that are now sourced from the VAG donor car, along with its brake discs and calipers. As such, we are not expecting vast differences when it comes to the ride and handling, and this early example is pretty well sorted, with a relatively compliant ride and handling that, while slightly light over the front end, offers good levels of grip and useful feedback to the driver. A rod and cable based gear change mechanism is carried over to the later cars and quite right too – it’s light and precise. Elsewhere in the cockpit, VAG sourced instruments will replace the Rover items found here, along with a new adjustable steering column, hand brake lever and cables, wiper motor and arms. Although you are unlikely to use the donor’s radiator, the standard rad and fans also fit under the EXi’s front clam. 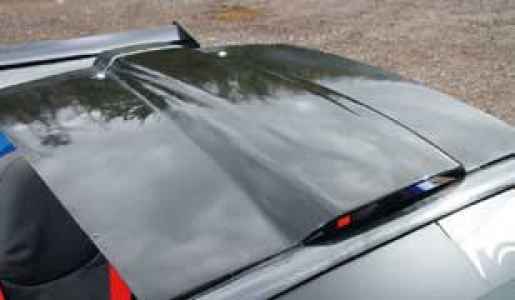 Of course, one feature which is new to us is the roof panel fitted to this car. 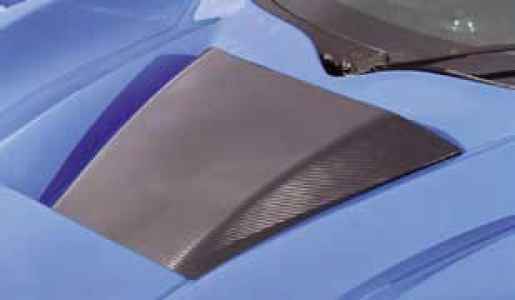 While the roof scoop may be purely cosmetic, the reality of having the panel in place makes a startling difference to the driving experience. Despite no side windows or rear glass, there is almost zero wind buffeting in the cockpit… at seemingly any speed. It’s brilliant. While the fit and finish of this panel is basic, a more developed component could and should prove popular. In terms of any other weather protection, Marlin offers a full soft-top option. That probably makes sense and either the half hood or solid roof panel would certainly enable you to get home without getting soaked. With its single donor, building a Marlin EXi looks set to be a comparatively affordable prospect. Kit prices begin at £2749 plus VAT for a starter kit with chassis and many ancillary components included and the factory reckons a sensibly built example using the donor’s VAG engine could hit the road from around £15,000. For a car with potentially startling performance and utterly original styling that sounds about right to us. The Marlin EXi has been around since 2003, yet to our eyes it’s ageing very gracefully indeed. In fact, in amongst the mêlée of replicas that continue to dominate the scene, we’d go as far as to say the EXi looks potentially more appealing than ever. Far from resting on its laurels, after 40 years of continuous production, it would appear Marlin is still delivering quality kits into the scene. Cheers. Lotus rear wing is adjustable. 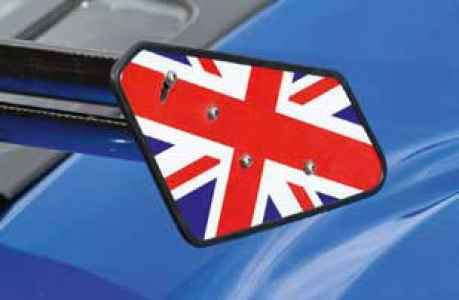 Roof panel derived from Exige. Reduces wind buffeting considerably. Carbon effect vinyl wrap adds visual detail to front vent. Lack of doors makes getting in tricky with roof on. Lotus links strongly hinted at. Lack of doors makes getting in tricky with roof on. Interior spartan, spacious and surprisingly well appointed. K-series to be replaced with VAG 1.8-litre turbo or Honda VTEC. Rover dials will be replaced with VAG items. Elise seats here, but Marlin also makes its own. Rover K-series won’t be an option in future. EXi styling hasn’t dated, despite being launched in 2003. Marlin is hugely entertaining on fast sweeping B-roads. 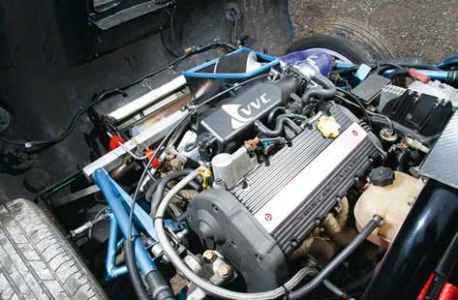 ENGINE AS TESTED: 1.8-litre VVC Rover K-series. ENGINE OPTIONS: 1.8-litre VAG petrol either naturally aspirated or turbocharged. SUSPENSION: Double wishbones all round, coil-over dampers. BRAKES: VAG vented front discs and calipers. Solid rear discs and calipers. STEERING: Marlin rack with VAG upper column. PRICE: £2749 plus VAT.